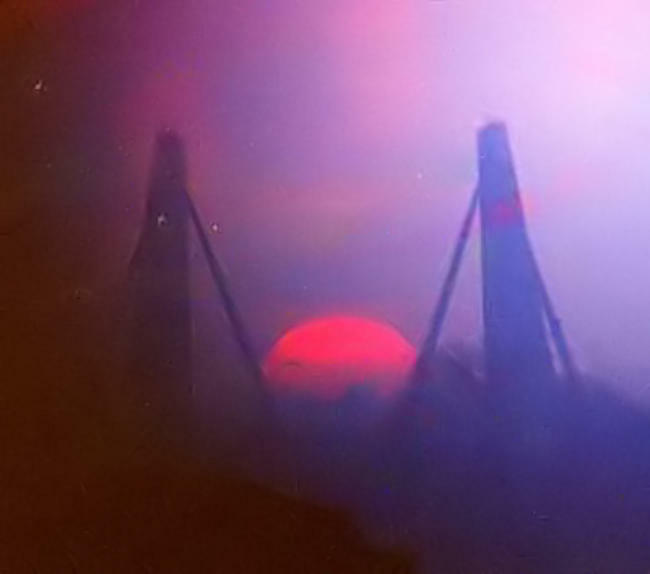 When viewed from the promenade of rue de la Commune on the equinoxes, the Sun can be seen to rise perfectly framed by the pylons of Pont de la Concorde. The installation uses an inlaid stainless steel arc to show where the sun rises on the horizon over the course of the year. 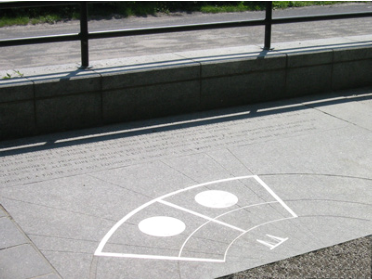 The engraved text explains the equinoxes, the solstices, and why the position of the sunrise changes: “The Earth follows its annual orbit around the sun at a speed of 30 km/second. This movement, combined with the Earth’s axis of 23.5 degrees, means that the Sun rises each morning at a different time and at a different point on the horizon. The solstices occur around June 21st and December 22nd. 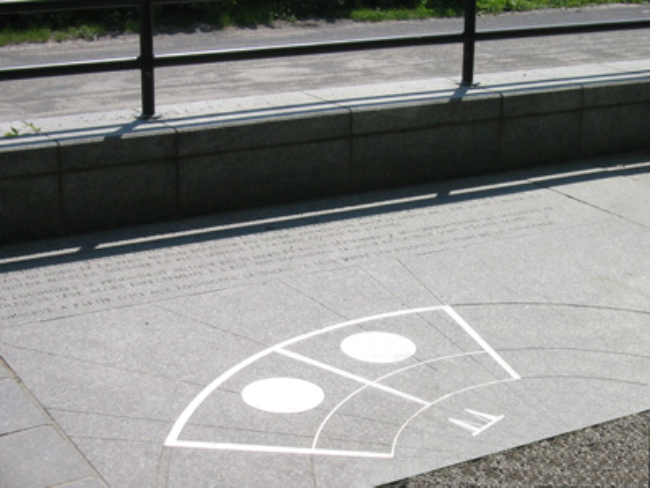 They mark respectively the most northern and southern positions of the sunrise. Also marking the beginning of summer and winter, they indicate the longest and shortest days of the year. 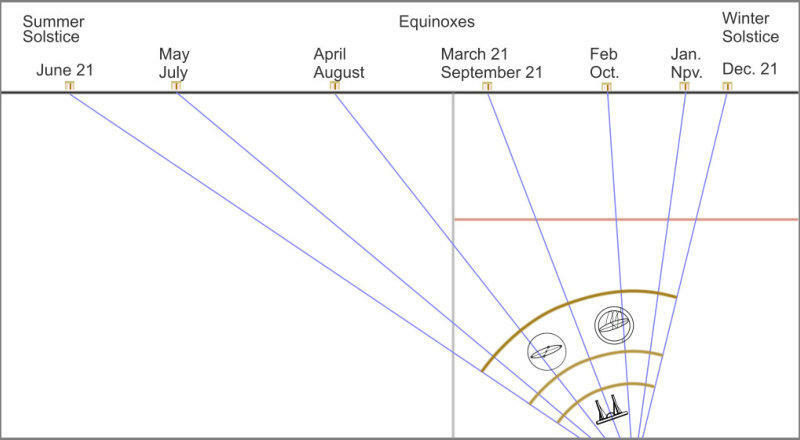 The equinoxes occur around the 21st of March and the 22nd of September, almost halfway between the solstices. On the equinoxes the Sun rises due east and the day and night are of equal length.” Due to the trees that were planted after the installation was created, the equinox alignment is best seen in March before leaves obscure the view of Pont de la Concorde. Sunrise positions on the horizon are indicated for the whole year. 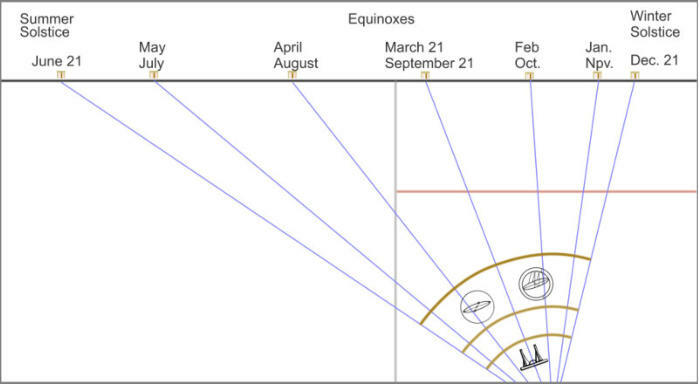 The equinox alignments occur at dawn on approximately March 21st and September 22nd. Designed by Katsuhiro Yamazaki; metalwork by Alfred Pfattischer; stonework by Montval; photo of Equinox sunrise by Louie Bernstein; photo of Equinox installation by Elliot Selick.